In the years since it hit cinemas, Dredd has gone on to become a cult favorite, earning a solid fan base along with a favorable critical reception. So why are we still not any closer to getting a sequel? Most folks will agree that the first flick warranted a follow-up but mainly down to its lacklustre box office haul, it's yet to materialise. Writer-producer Alex Garland previously dubbed the movie "a failure" but its star Karl Urban isn't so quick to dismiss the film. Talking to Den of Geek, he pins blame for the film's poor financial performance - and the likelihood of a sequel - on marketing. "Alex Garland has gone on record to say that Dredd was a failure. I disagree. The movie itself was not a failure, in fact it was a critical success, it just failed to perform at the box office. How does a movie with a 78% approval rating on Rotten Tomatoes fail? Through zero audience awareness. Nobody knew the movie was being released. 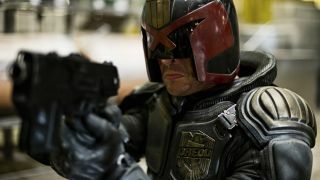 Dredd represents a failure in marketing, not filmmaking. Dredd sold 750,000 units, in North America, the first week it went on on DVD, which earned it a lot of money and the number one slot. Proof that the audience, once they became aware, wanted to see it." "The unfortunate theatrical release of Dredd and the manner in which it was mishandled made it problematic for Dredd 2 to be immediately funded and produced in the same fashion," he adds. "But the success it has achieved in all post-theatrical mediums has definitely strengthened the argument in favour of a sequel. But it’s not an easy sell. I’m constantly blown away by the fan support and love for Dredd." This isn't the first time Urban has stepped up to bat for the uber-violent comic book adaptation. After saying for years that he'd happily reprise the role on the big screen, he recently gave a thumbs up to a potential TV revival on Netflix or Amazon Prime. The possibility of a small-screen outing boils down to the cost of cranking out a series that's on par with a $50 million movie. As he says, the home video numbers are promising, and the demand is there by Dredd's loyal followers. So when will someone pick up the tab?